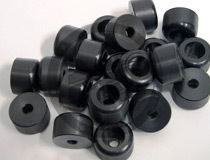 We manufacture precision custom made machined parts in any engineering plastic. Our vast machine park and stock of material allows us to produce precision parts in virtually any size any shape in any material. Our parts are manufactured on 3 and 5 axis CNC mills and lathes as well as laser cutters. Stock materials include: Nylon, polyethelene, ptfe (virgen and repro), polypropylene, Delrin, peek, Rulon®, PMMA, pet, pvc solid, flexible and foam, polycarbonate, etc. Having the materials in stock mean shorter lead times and better service. Machined parts in PTFE with glass fibre offer greater resistance to traction and deformation. Machined parts in PTFE with graphite reduce wear and deformation by reducing the coefficient of friction. Machined parts in PTFE with carbon are superbly resistant to traction and deformation. Machined parts in PTFE with stainless steel have very low permeability and highten resistance to compresion. Machined parts in PTFE with bronze/molybdenum disulphide give resistance to wear and deformation while lending also thermal conductivity and reducing electrical properties and chemical resistance. 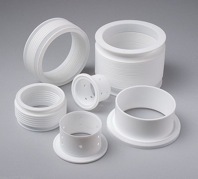 Machined parts in PTFE with nickel augment wear resistance. The main advantage of machining parts is the ability to produce prototypes, short and medium sized series with no tooling costs. Secondly, but equally important are the tight tolerances we can produce to. Among many other parts, we produce washers in any size, grommets and valve seats in PTFE, balls cylinders, boxes, bellows, diaphragms, etc. Although most of our production in machined parts is done in engineering plastics we also produce parts in bronze, copper and aluminium.